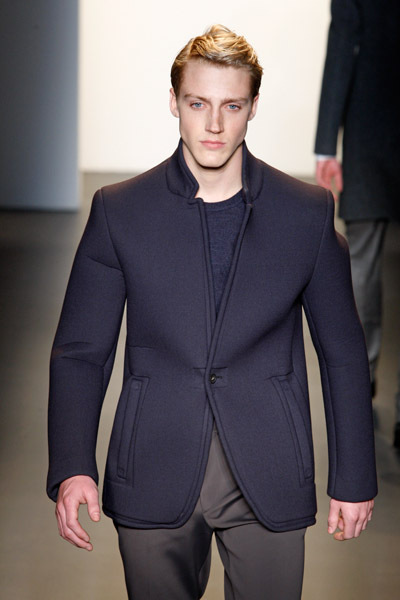 For next winter Veronique Nichanian designed a qualitative and diversified menswear collection for Hermès. Just like many desigers Veronique opted for gray as the main color. Though she added some red, blue, green and black. The Hermès models were well-dressed and much attention was paid to every little detail. From the floral scarfs to the handkerchiefs in the breast-pockets and the chains attached to the trousers. The collection had velours jackets, turtle necks, woolly cardigans, leather pants and jackets with zippers that were only zipped in the middle. 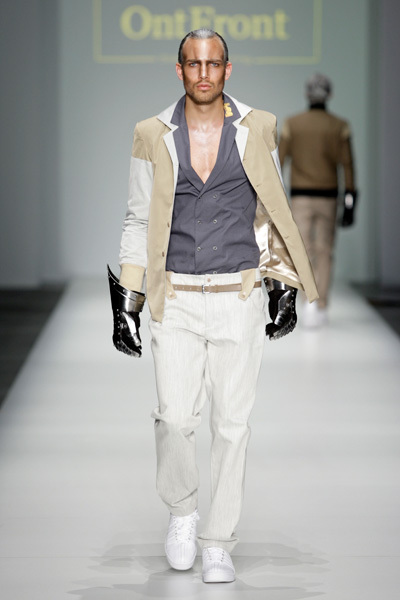 Over a few coats the models wore a sophisticated leather belt and their large scarfs were tied in a particular way. Two snake leather jackets were real showpieces. 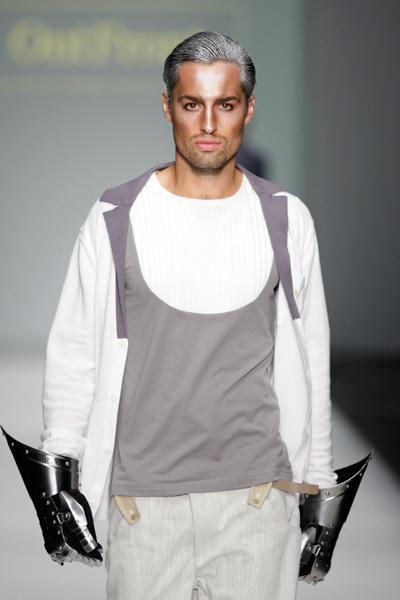 Altogether it was a solid collection with very wearable designs. It was an almost poetic show at Ann Demeulemeester, also thanks to the building – the Couvent des Cordeliers. Is it a coincidence a lot of collections have that classic, mysterious Sherlock Holmes feeling, with all the capes, keys & chians ? Black, white and beige were the main colors and Demeulemeester wrapped her men in belted (fur) coats, jackets and loose trousers. All mixed in that familiar nonchalant way we know from the designer. The chest and neckpieces of irridescent black feathers were stunning and added a special, dark but glamourous touch to the collection. What would Jesus wear nowadays? If he shopped at Givenchy, he’d wear sandals, black stockings, a kilt, shorts and a gold crown of thorns necklace. The models at Givenchy looked like modern monks in their black and white clothes, black sandals (sometimes with, ugh, black shiny stockings), high collars and long coats. No laughs, no fun – this was serious man! 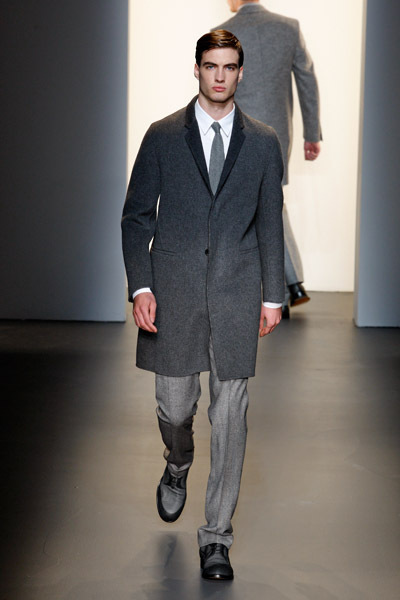 But without all the fuzz, the basic collection is about a suit, a puffy jacket, a kilt, a white shirt and a long coat. Enough to mix endlessly. Rick Owens continued to search the depths of the dark side with a fall-winter 2010 menswear collection of gender-bending, space age-y designs ready for the apocalypse. Androgynous models with enviable cheekbones skulked down the catwalk in bulky, tie-waisted trenches in lacquered microfiber or wrinkly microfiber with stiff, standup necklines and drop-crotched harem pants. Some wore ribbed turtlenecks with knee-length flaps in the front and back, while others sported leather tank tops that left their backs bare. 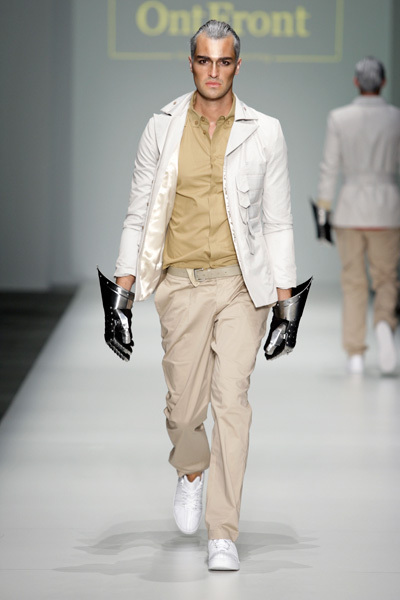 Overall, the collection, with its asymmetrical hemlines and great floppy flaps of fabric, strayed away from his usual somber palette, regarding some looks in light gray or shiny off-white. Dries van Noten knows his way with menswear, with just that little touch of eccentricity and panache. 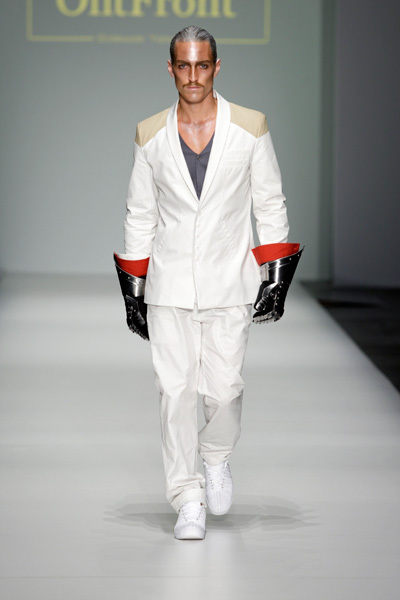 The Belgium designer focused at graphic details, think black (or red) and white stripes, piping, mixing checks and stripes and he took inspiration from the English jockeys. From dressed down sweat-styled trousers and bold electric blue separates to contrasting inserts, Van Noten’s man proved to be confident and stylish. 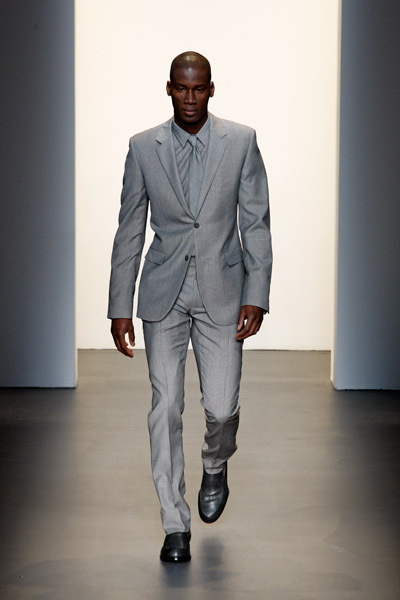 What are you wearing during the Menswear Fashionweek? Your Burberry-boots, your latest D&G-vest or that vintage YSL? Maybe we’ll spot you in Paris, Milan, New York or Amsterdam. 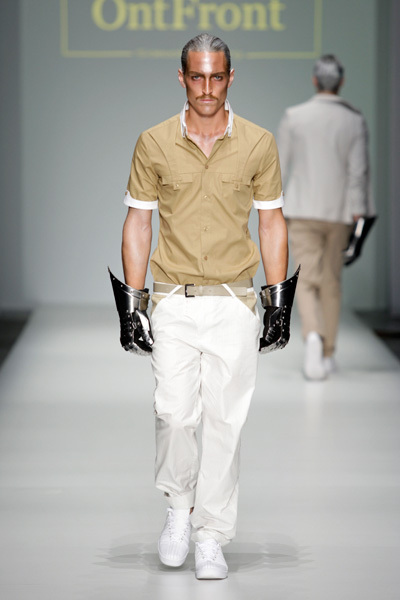 During the fashion-weeks we refresh our streetwear-category regularly. We don’t judge, we’re not the fashion-police, we just enjoy fashion and your own personal style. Next stop: Paris. The D&G fall-collection is the answer to what the well-dressed snowboarder will be wearing, in the snow or at the after-ski. Thick Fair Isle sweater-coats, trapper hats, chunky turtlenecks, shimmery ski pants, shearlings and bombers—all luxe and made to be layered. 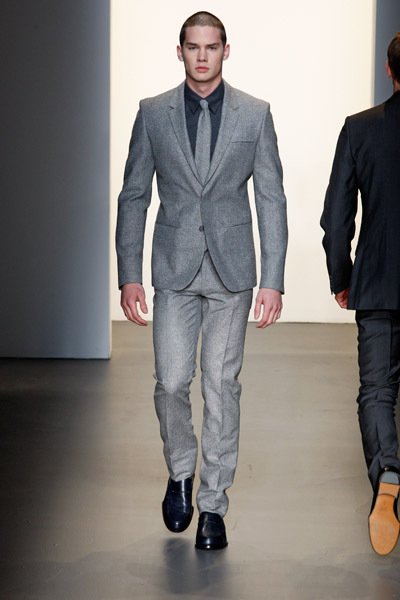 Mixed with gray flannel suits, a velvet blazer or even a black tie and the Olympics can begin. Ontfront started out as an underground platform for young artists, fashion designers and musicians. Aware of the fact that the clothing industry is oversaturated, OntFront came up with a fresh concept. What do you wear when you’re grown too old for your neon one-liner t-shirts and you don’t want to wear a suit? And what do you wear when you want to look sharp, but not stiff? 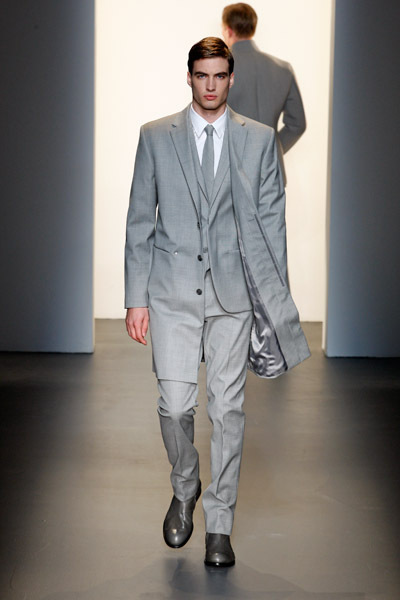 Sidewalk Tailoring is the answer. By combining classic suit tailoring with cutting edge street influences OntFront bridges the gap between these two distinct styles. 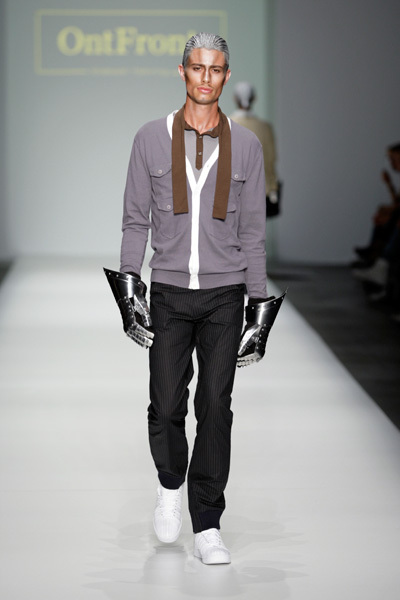 For spring/summer 2010 OntFront created a 60 piece collection called ” Tonight is the Knight”. 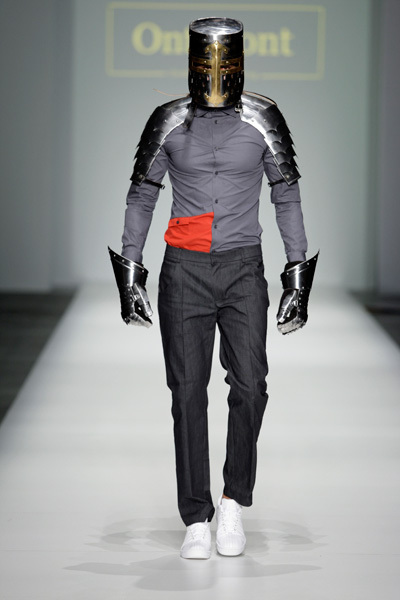 Inspired by the bold iron armor of the middle ages. 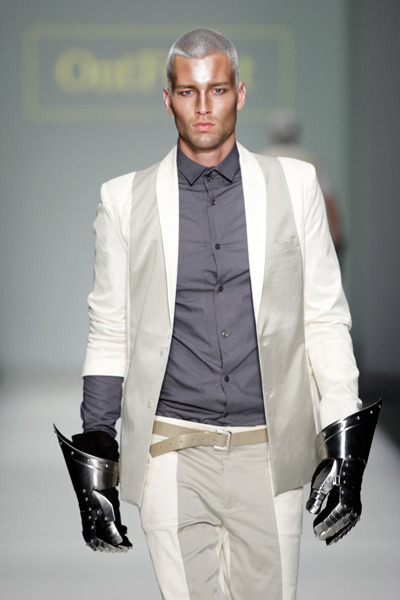 Classic elements of the harness were translated into sophisticated and comfortable pieces for the modern knights. Outside the venue of Calvin Klein in Milan we spotted a group of gorgeous looking guys in a black Mustang convertible. The picture took us back to the future. Actually the car stars in CK’s new adcampaign for the men’s fragrance CKFree. It’s one of those young, fresh, upbeat fragrances we know so well of Calvin Klein.